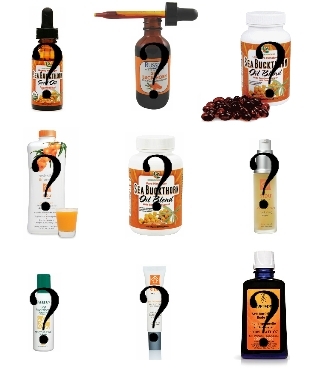 If you’ve felt the wonderful effects of sea buckthorn in your life, share your story so that others may benefit! so that we can learn! A nice skin softner July 13, 2011 – From District of Columbia. This is a good product. It softens,reduces crows feet, and laugh lines. I would highly recommend. great stuff! July 08, 2011 – From Washington. I use this internally and externally, I rub it on some sun damaged spots on my arm and they are lighter and smoother. Saw improvement of rosacea in 24 hours, August 5, 2008. By Matthew Dees “http://www.coffeetweek.com” (PA). A few months ago I developed rosacea. I never had acne in my youth, though I did suffer from psoriasis in my early thirties, until I found a remedy using natural herbs and vitamins. I wanted to find something similar for rosacea, if possible.I Googled some term words looking for an answer. I noticed quite a few posts from people swearing by this “SeaBuckthorn” stuff. I’m not one to easily part with cash and $26 (after shipping) seemed like a lot of money to risk for something I never heard of – and what is SeaBuckthorn, anyway? I still don’t know. When you’re desperate, however, you’ll try almost anything.The oil arrived quickly and I wasted no time. It has an orange color and I immediately wondered if my nose and cheek a – no scrubbing needed. Though I don’t sleep with it on, because of it transferring to the linen, it does not permanently stain fabric. It would be nice if it were colorless, though. rea would remain that color. It doesn’t. The oil washes off with water and a little soapI also thought the size supplied wouldn’t be enough. It is a small bottle, about 3 inches high, but I’ve been using it for 2 weeks now and haven’t put a dent in it. One drop is enough to cover my nose and surrounding area.I saw results 24 hours after my first application, having left it on while I was at home all day. I thought it was wishful thinking, but my child verified that the redness had subsided. In a week the rosacea was greatly improvedand now, at 2 weeks into use, it is reduced to looking like a few bumps on my nose – which is much more acceptable compared to how it had looked. I’m hoping that eventually all signs of the rosacea will be gone.Bottom line: Yes, it works, and was worth every penny. It may become the next great discovery for skin remedies, following in the footsteps of Flaxseed Oil relieving psoriasis. great for weight loss, July 18, 2011. By Alegrand. After finding out that Dr Oz recommended this product to help in wieght loss…well lets just say I bought it! I have been using it for almost 2 weeks and i have loss 4lbs. My skin looks great and my hair too! I haven’t tried it on my skin yet but after reading other reviews I think I might!I also have found that its gives me natural energy that I haven’t had since my child was born. I can think alot clearer as well. Give nature a chance., July 18, 2011. By Robin Scott (Fripp Island, SC, US). Seabuckthorn Berry Oil, lives up to its reputation. I am a registered nurse. I usually depend on pharmaceuticals. Today, I have a totally different approach to healthcare. I take Seabuckthorn Berry Oil only once a day. I see a difference in my health, rapid healings, memory improvement, stamina improvement, and GI improvement. It works systemically as well as topically. I will continue to use this product for myself and my family and simply advertise to friends and contacts. Keep this product available, so I can continue to be available. Thank you, founders of this substance. Good Skin, May 17, 2011. By Teacher. My skin has a luminous quality about it when I take the Seabuckthorn gels on a regular basis. People can really notice when I am on a regime or not. Sea Buckthorn for life, September 25, 2011. By sweet life. Sea Buckthorn is amazing. So far it has helped my skin feel softer, my finger nails are stronger, and my hair does not have split ends and is not breaking as it used to. You have to be patient because it takes about three months to notice the difference. My vision has also improved and I no longer have dry eyes. By Monique ( Covington, WA) 7/19/2011. I noticed the difference right away in the amount of energy I had plus the metabolism increase. I was happily suprised! By DEBBIE (Chelsea, AL) 10/3/2011. Wow – this is awesome. Bought it for my ulcerative colitis after I saw that it helps heal the digestive tract on Dr. Oz TV. So I read more about it and saw the numerous claimed benefits of hair, skin, overall body. I love it. Does not upset my very sensitive GI track and I break the capsule open and apply on a deep scar, on my face and neck .. it is awesome. My eyelashes are thickened up and my skin looks so soft and I think my deep brown spots are lightening! August 26, 2010 By AbundantStar from San Diego, CA. “This is an absolute necessity for everyone to take! My skin has been dry for years. After taking 2 softgels for 3 weeks my skin is soft and smooth again. I have now increased my dosage to see if I can receive some of the other benefits that this supplement is known for. I constantly recommend it to my clients for the omega benefits for Hair, Skin, Nails and others. I am excited about this product! Spread the Word and Share Us!